Following my earlier article on free wi-fi services, there are two noted development which are of interest. competition. Is the government free wi-fi service deployment extensive enough and fast enough? This is for you to judge. The information of the project is as follows. I think wi-fi services are for those staying at one location for some time and wish to access the Internet for information. Some locations are weird, such as birth and marriage registries, district hygiene offices and SWD field units. But who know what internet could do in the future. The most important point on this topic is internet security. On this, the paper says: "To prevent citizens from entering into obscene web sites with the Wi-Fi facilities, appropriate filtering software will be installed. Network monitoring systems will be implemented to monitor and stop improper use of the service, such as spamming. Relevant security measures, such as user isolation and data encryption, will also be introduced to ensure the proper use of the service by citizens. Helpdesk support will also be provided to assist users of the Wi-Fi service." Filtering is a very controversial subject. I do not know how websites are classified as obscene or impropoer. Furthermore, would adults be prevented to access sites for adults, or selected groups be prevented to access selected sites? Other security measures are virtually none. This is a worldwide situation that all systems have loopholes, including mobile phones and fixed line phones, not to mention many so-called secured systems in banks and large corporations. The second development is a LegCo question rasied in last Wednesday's meeting (23 May) specifically on wi-fi security. I append below a gist of the reply of the government. - OFTA has followed up the case with the ISP and required them to provide effective security measures for ensuring effective delivery of their clients' information. OFTA will consult relevant licensees with a view to setting up industry guidelines and code of practice and will also request them to conduct regular security audit for their systems. - We will strengthen the promotion of information security to the public through existing promotional programmes and channels: dissemination of leaflets, conduct of road shows, etc. - We will specify the security requirements for Wi-Fi services at Government premises to ensure that the contractors will provide the necessary hardware, software and technology with appropriate security features in delivering the required services. intrusion prevention and detection systems, filtering software, etc. - We will also engage security consultants to perform security risk assessment on the Wi-Fi network designs, and conduct security audit after the networks have been put into full operation to ensure that the services provided meet our security requirements. I would say this is a typical bureaucratic type answer giving an illusion that government is doing something but in fact she cannot do anything. For the fast developing world of IT security and insecurity, I think we need to be aware of the danger and take reasonable precaution. Up to date information on how this battle is going on is essential. Besides that, we cannot do much more than to be careful about personal information, which I think is actually not a secret. We need to realise the fact that our personal information is known to many others very often for legitimate purposes. It is the illegal use or criminal use of our information that need to be guarded. I came across this book at Commercial Press a few months ago. The cost was $160. I didn't buy it in the first instance but instead went to the Victoria Park Book Festival hoping to get a discounted copy. Yes, there was a simplified Chinese version of the book at $30 only. I thought simplified Chinese was not a problem for me, but I was wrong. Simplified Chinese characters were not a problem. There were not too many simplified characters and I knew most of them. However, the problem was the translation which carried a lot of phraseology and idioms used in the Mainland. Although I could decipher them for their Cantonese meaning, the process of mental translation slowed me down a lot. I could only finish two chapters in several weeks. At last, I went to Cosmo to get the original book. Luckily, the new paperback version only cost less than $100. It was not a great penalty to me for buying the second copy of the book. I finished reading the book during a trip to Africa. The book is a world view from the angle of an economist. It is lucidly written complete with some interesting examples. The main theme circles around the ideal of a perfect market, but unfortunately there are always conditions that destroy it. They are scarcity, incomplete information and externality. The first few chapters are the most interesting and they concern scarcity. The most striking example, which makes the book famous, is the high price of coffee in prime location shops. Prime locations are scarce, and landlords demand extra high rents. To make the most of the scarce resources, coffee price has to be high. It is possible because there are many price insensitive commuters passing by in a hurry. On the other hand, there are also price sensitive customers who do not mind walking a few hundred metre more to buy normal price coffee. Coffee shops differentiate the customers and create coffees of different prices and varying degree of prestige, like special brands, special flavours and special additions in order to attract both types of customers. There was a coffee bar called Costa Coffee which offered fair trade coffee: products directly marketed for the third world producers. Customers were charged more and they paid thinking they were helping non-privileged farmers. It turns out that the marginal costs of all the high price varieties are very little compared to the big price difference. Owing to customer protests of being cheated, Costa Coffee had to withdraw its so-called fair trade coffee. Notwithstanding that, many customers are willing to pay more for more prestigious products, but with inflated price. The book also reveals the strategy of supermarkets in setting the price of their merchandise. Besides differential pricing for similar products of slight variations, like organic products and brand name products, supermarkets deliberately arrange them at different shelve locations. Similar products with different prices are not placed side by side for easy comparison. Cheap products are put in inconspicuous location. It really pays if one could spend a little more time comparing prices when shopping in a supermarket. - Companies are making things the right way. - Companies are making the right things. - Things are being made in the right proportions. - Things are going to the right people. However, a perfectly efficient market does not always ensure fairness. An example is that interference to the market is made in providing to the poor in the form of subsidized heating fuel. We agree to distort the market so that the poor do not have to face the truth of high fuel cost. For arguments and solutions, you may wish to check out the book for various models proposed by famous economists. The book also explains the phenomenon of rational insanity. In a complex market, take the stock market for example, there are educated and intelligent rational persons who are capable of gathering all information affecting stock prices. However, if all information leading to a rise or fall in stock prices are known, all rational investors will be capable of predicting stock price movement and act accordingly, leading to no predictability at all. As a result, all that is left to affect the market is unpredictable news. As such, stock prices and indices move at random affected by such unpredictable news. Although the long term trend still reflects the basic analysis, on any given day the trend is dwarfed by random movements. The paradox is that perfectly informed investors produce a random market, but a random market doesn't reward anybody for becoming perfectly informed. A similar phenomenon is at work at supermarket checkouts: which queue is the quickest? If it was obvious that which queue was the quickest, people would already have joined it, and it wouldn't be the quickest any more. So you may as well stand in your queue and don't worry about it. It is the same as randomly joining any queue which looks shorter. Besides the costs to the buyer and the seller, very often a market transaction may involve costs external to them, i.e. costs to a third party. An example quoted in the book is the buying of petrol at gas station where the transaction creates externality effect of causing noise, accidents, traffic congestion and air pollution. One of the solutions to deal with the hidden externality costs which distort the perfect market is to include the cost in the transaction. Some cities have introduced externality tax to drivers in order to control the use of roads, promote better engine performance in noise and emission, raise levy to traffic accident compensation and subsidize low pollution fuel. I think the high tax on tobacco is another form of externality tax as a penalty or compensation to the harm of smoking. The recently proposed tax on plastic bags is also another example of attaching a value to the external cost. The book raises a viewpoint that the ethical standing of the environmentalists is a result of the fact that public policies do not make evident the environmental costs of our actions. If the effect to the environment of our actions is clearly defined in term of externality costs, environmentalists could argue their points from an economic standpoint. Much of the moral tone would then drain out of the debate and the environment itself would be much more effectively dealt with. When environmentalism is merely a moral issue, even environmentalists themselves cannot work out the real impact of everyday decisions. An example is the initiative to use less disposable diapers which could clog up landfill sites or use more washable diapers which will pollute the environment with the washing process and chemical detergent. The diaper problem, and other environmental issues, will not be solved by a small group arguing inconclusively over the morally appropriate individual action. If the environmentalists could not have the clear cost signal on the environmental damage, the majority of people would not inconvenience themselves even if they understood environmental problems. Both information and incentive in the avoidance of externality cost are necessary. The last part of the book is on globalization and the economics of why some developing countries stay poor. This is where the book is criticized by many academics of putting forward assumptions without substantiation. I also think that the author is raising swift remarks without convincingly supporting them with sound arguments. However, this does not diminish the value of the book as interesting reading material. 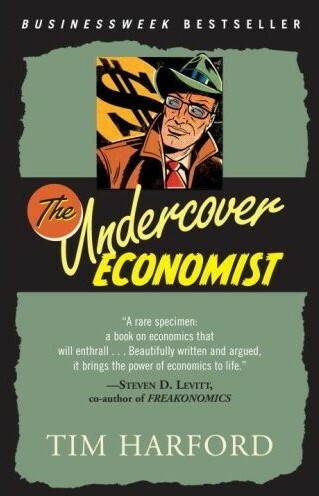 It is still a book I recommend, even to those not interested in economics.